(1045): no grate, Dimensions: 32" outside diameter 27 1/8" diameter opening 8 1/8 " outside height(813 mm x 689 mm x 206 mm),Weight: 19 lbs. (9 kg), Containment Capacity: 22.8 gallons (86 L).Each for 76.00. (1046): with grate,Dimensions: 32" outside diameter 27 1/8" diameter opening 8 1/8 " outside height (813 mm x 689 mm x 206 mm),Weight: 26 lbs. (12 kg)Containment Capacity: 21.1 gallons (80 L). Each for $114.00. •Keeps floors free of spills — designed to collect and contain drips and overflows associated with filling of 55 and 30 gallon drums. 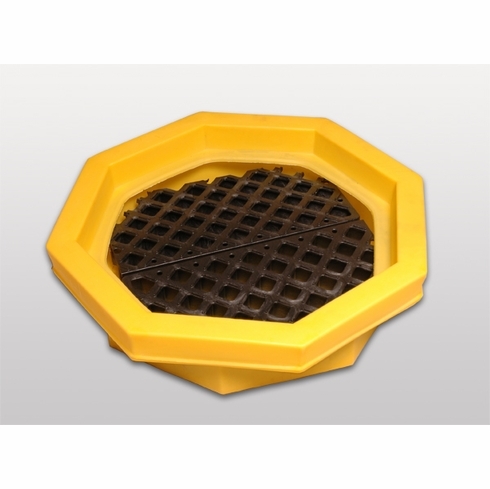 •Optional bottom grate elevates drums 2 5/8" and out of spilled liquid. •Meets EPA Container Storage Regulations for 20 gallon or smaller containers with bottom grate in place.